How Should You Choose a Sound Bar? Just as with televisions and phones, sound systems have become sleeker and slimmer with time. Sound bars are the easiest and least expensive way to add or rather enhance the quality and output of sound in your living room. Soundbars can be attached to your television screen or music system for more enjoyable sound quality. Some sound bars can even create a “surround sound” effect without having to deal with frustrating wires. Installing sound bars in the living room is the cheapest and most convenient way of getting better sound from the television. They are quite simple and inexpensive and often wireless. However, not all sound bars are of good quality, and they may not deliver the desired output. After going through thousands of reviews, we have put together a few pointers to make it easier for you to choose the perfect sound bar. What should you consider before buying a sound bar? Look at the types of sound bars: Select the right type of sound bar that would suit your needs. The most common design is a bar with a long and thin appearance equipped with a speaker that comes with a subwoofer. Today, you can even buy wireless subwoofers to use with your sound bar. Check the design: Opt for sleeker designs if you love aesthetic looks. Go for sound bases, which are thin and space-effective than traditional bar design. They serve to be the pedestal for the television for which they never cause a blockage on the remote sensor. 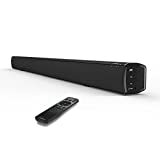 Check the size: Decide on the size of the soundbar as the sound bars are available in a variety of shape and size, which range from a few inches to feet together. 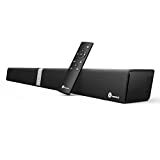 Even though the larger sound bars tend to come with more drivers and great sound impact, at times, you will have to pay higher prices for the bar size. Stereo or surround sound? 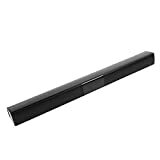 : The basic sound bar models all have stereo sound. As the price increases, so do the number of channels that the sound bar provides. While three-channel sound bars are the most common, a high-end sound bar can have up to 7 channels. 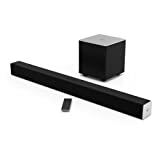 If you are looking to simply enhance the sound quality, a simple sound bar would suffice, but for a cinema hall-like sound experience for watching movies, a surround sound feature is quite essential. 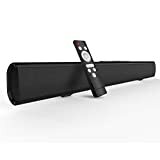 Decide what devices will use the soundbar: Besides television, sound bars can be connected to music players, tablets, and even smartphones. 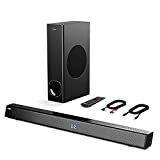 Compatibility is a consideration here, as not all types of sound bars may work well with all TVs.The type of connectors your sound bar needs depends on the devices you need to connect it to. Choose a sound bar with built-in Bluetooth and USB ports, as well as digital audio inputs. Mounting: There are two main methods of mounting a sound bar. Some sound bars are intended to be wall-mounted, whereas some are placed on a stand near the TV sets. Look for additional features: Ensure HDMI input jacks are available and look for additional built-in features like compatibility with wireless and Bluetooth streaming and streaming from Internet radio stations. Wi-Fi streaming is a more advanced feature that overcomes the few hassles involved with Bluetooth-streaming. Tip: These tips would help you to choose one of the best soundbars that will make your entertainment time worthwhile.